This is our squad in the front of the T-Rex theater posing for photos. The Jedi was nice to the curious Jawa, so Jawa didn't steal the glowy stick. Could we get any more nerdy? We probably could! What a week! Now Christmas is almost here. Rogue One was so awesome and I can't wait to go see it again! Our morning started off with us on the news, and I'll share the clip below. I couldn't believe how nervous I was. You would think that because I had a mask on I wouldn't be nervous at all, but when I walked into the studio my legs got shaky. I survived though! My friend Flounder helped talk me down from my anxiety attack. After the news we went back home to nap because we were going to be at the movie theater all night. Of course I couldn't nap because I felt like a kid waiting to go to Disneyland. I barely ate which is not like me at all. We arrived at 5 and didn't leave until 12:30 but was well worth it and so much fun! My kids were their too along with my son's girlfriend. They all knew that I was proposing and were really excited! 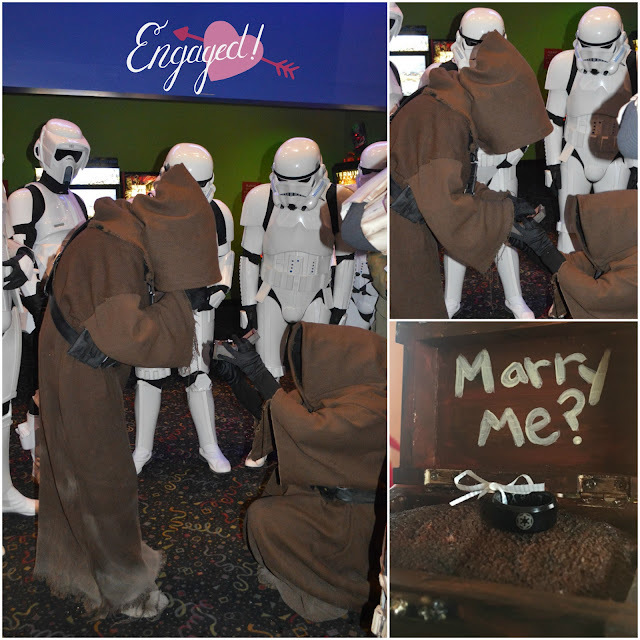 A Star Wars engagement was what I wanted and around 6:45 was when I proposed to Mary, yup that's me in the Jawa costume on one knee. She had no idea that I was going to do it, which was the best part! Apparently it's very hard to surprise her. Q. Will it be a Star Wars wedding? A.Yes, but more of an inspired theme with subtle hints of the Empire and maybe a couple of our 501st friends wouldn't mind posing for a couple pictures. Q. Isn't this a little soon? Q. When's the big day?? We also will not be wearing our Jawa costumes, though that would be funny. Well this week will be crazy for us because of Christmas and I hope all of you will have a great holiday season! I can't wait to share our upcoming road trip and the silly shenanigans! That's me! The smallest Jawa!